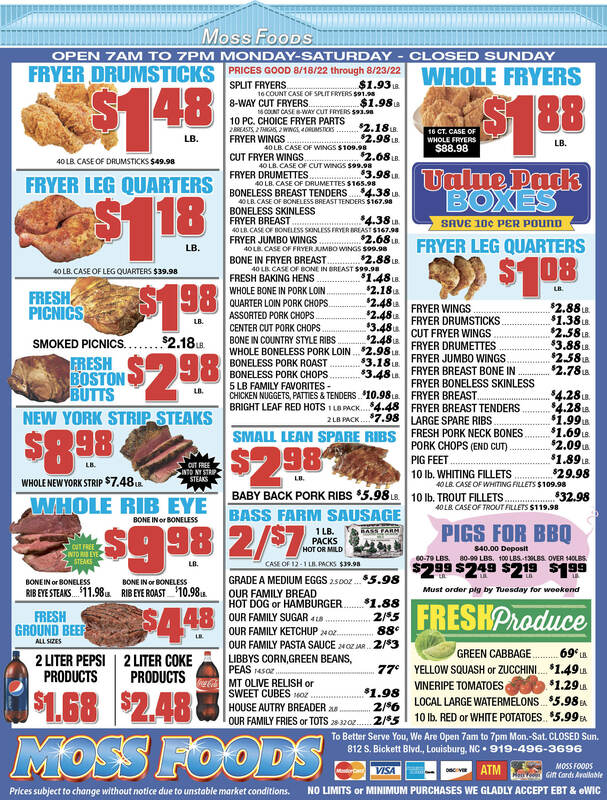 Showing 32 articles from July 4, 2018. LOUISBURG -- The Franklin County Board of Commissioners will host a public hearing next week to spell out how they will assess new development fees. The consensus appears to be that the county will keep the fees as they are, currently, and determine how they will be phased in. During spring budget discussions, engineers presented commissioners with an engineering report supporting the need to increase water and sewer development fees -- essentially, impact fees -- to cover the costs of existing and future system capacity. LOUISBURG -- A summer ago, stalwart attorney Charles Davis was a bit uncomfortable being the center of attention. 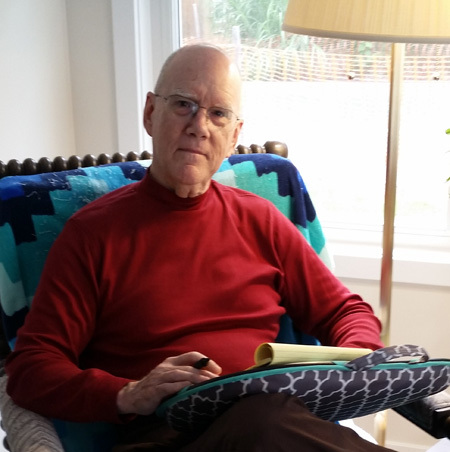 But, there he was, listening to friends, family and colleagues fete him with superlatives as he was presented with the John B. McMillan Distinguished Service Award, which honors attorneys who have demonstrated exemplary service to the legal profession. SHOWCASE. 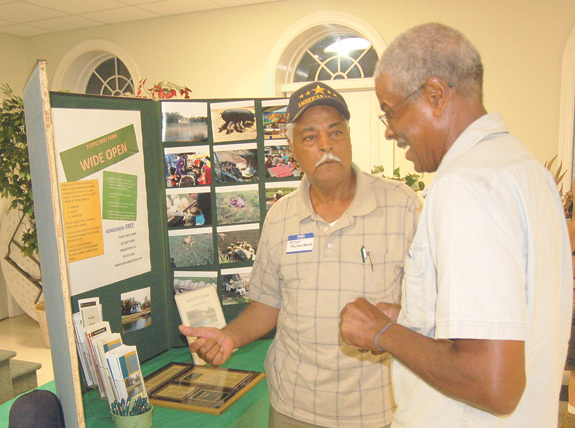 Farm business operator Bob Sykes, right, talks agribusiness with Alton Richardson. CASTALIA -- Operating a small business comes with a unique set of obstacles and challenges. During the most recent meeting of the Northeast Revitalization Committee, 17 area entrepreneurs shared challenges they all seem to face: the lack of effective and reliable Internet -- a necessary tool in the effort to market, promote and grow their business. 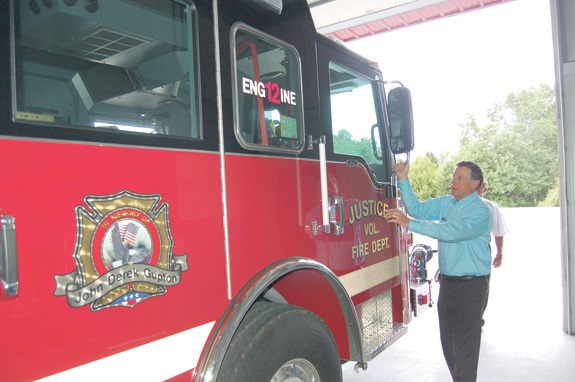 FRANKLIN COUNTY -- When Insurance Commissioner and State Fire Marshal Mike Causey took office last year, he noted that he didn't have nearly the staff or resources to do his job, which included inspecting the 1,351 fire buildings across the state. While he wasn't in town to inspect Franklin County's resources, he felt it was important to bring his staff and resources to bear -- that included ceremonial checks for Justice and White Level fire stations -- as well as other grant funding for the Epsom Fire and Rescue Association and Gold Sand Fire Department. The fourth made it official; half of 2018 is history! 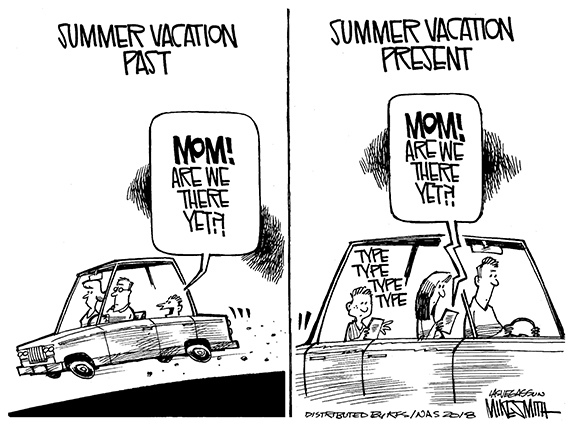 Well, so much for the first half of the year. 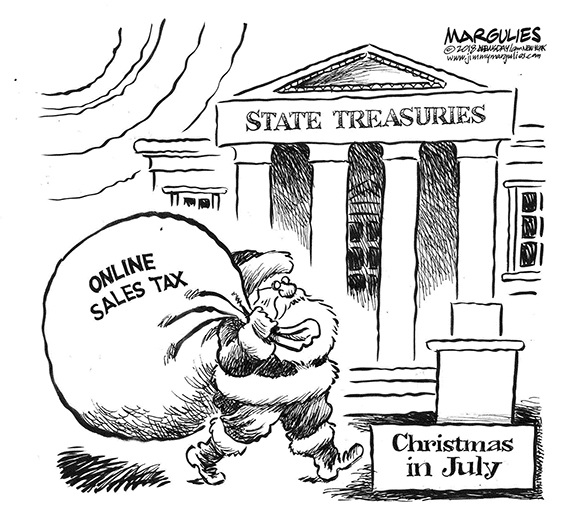 Not sure exactly where it went -- or how it got past us so quickly -- but it's time to brace for the inevitable fast-time slide toward the holiday season and, dare I say it?, Christmas! 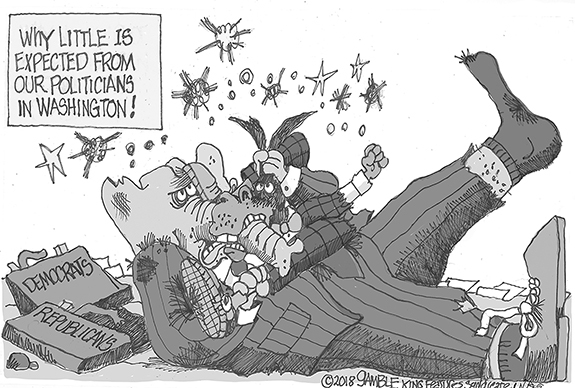 Isn't it time to tone down hateful political verbage? Last week, five Americans died for doing their jobs -- and doing those jobs very well. It happened when a strange guy named Jarrod Ramos, who had a long-standing grudge against The Capital Gazette newspaper, blasted his way into the building and used a shotgun to begin methodically murdering people. Last week, law enforcement from around the county and around the region swarmed into Franklinton, surrounding two men holding knives. No one could stop the slicing that took place, though, as Bill Pearce and Tim Strickland cut into a sheet cake, marking the end of a retirement luncheon that saw the two men leave North Carolina, Franklin County and Franklinton law enforcement with more than 75 years of service. Where was the outrage previously? The so-called mainstream media has been hyperventilating about Trump separating illegal alien border crossers from their children. In fact, during the first 10 minutes on at least two or three nights each, NBC News ran stories about the separations (and it's likely other networks did the same). 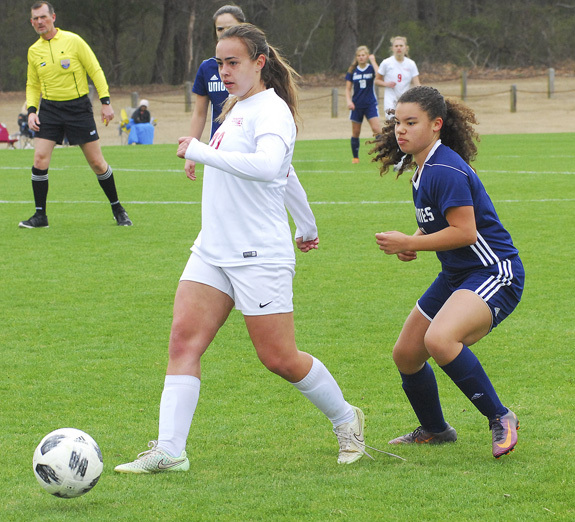 FRANKLIN COUNTY -- Two players from Louisburg and another from Franklinton have claimed prestigious positions on the North Carolina Soccer Coaches' Association's All-Region Girls Teams for the 2018 campaign. Louisburg was represented on the Class 1-A Region 4 squad by veterans Sophie Taylor and Jessie Wrenn. GEORGIA BOUND. 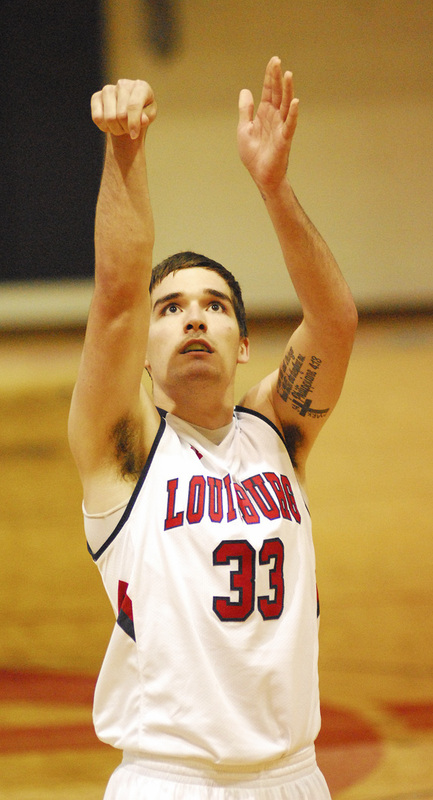 Louisburg College's Seth McCoy has signed with Young Harris College, a Division II school in North Georgia. LOUISBURG -- At four-year schools, rebuilding can be a daunting, dreaded proposition. But at a two-year JUCO program like Louisburg College, it's simply part of the job for men's basketball coach Neil Dixon. The Hurricanes said goodbye to a star-studded sophomore class after yet another Region X championship in 2017-18 -- along with a trip to the National Junior College Athletic Association Division II National Tournament in Illinois. 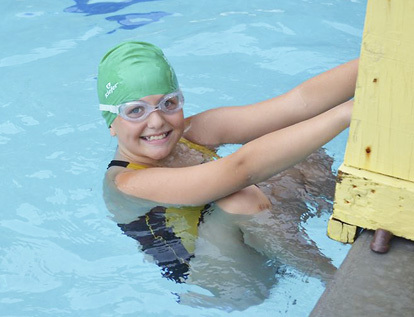 LOUISBURG -- Town and Country's Swim Team continues to enjoy an exceptional start to the summer 2018 campaign. The Stingrays' success continued last Thursday with a solid 226-134 home victory over the Winchester Waves out of Raleigh at the TC Pool. The triumph was a huge one for Town and Country as it was the first time the Stingrays have defeated Winchester at home in several years. ZEBULON -- Cooper Hummel went 2-for-3 with both a game tying home run in the third and a go-ahead RBI double in the seventh and Demi Orimoloye went 2-for-4 with a go-ahead home run in the fourth as the host Carolina Mudcats defeated the Astros 3-2 on Monday night at Five County Stadium in a Class A Carolina League baseball showdown. NEW YORK -- Christian Buffaloe, local Kyokushin Karate fighter, recently entered the prestigious Japan-sponsored "2018 Kyokushin Karate AAAOC Full Contact Championships" in New York. Buffaloe, a seven-time Kyokushin youth & teen champion, fought for the first time as an adult in this world-level event. GREENVILLE -- East Carolina University's Bryant Packard has been added to the 2018 Collegiate National Team (CNT) roster according to a release by USA Baseball Monday evening. Packard will join fellow classmate Jake Agnos and Pirate Head Coach Cliff Godwin (third base and hitting coach) this summer representing the Red, White and Blue. BUNN -- Bunn High School's 2018 football season will kick off August 17 on the road against North Lenoir. This will be the initial campaign on duty for new BHS head coach Dale Murphy. The Wildcats' home opener will be Aug. 24 versus county rival Franklinton. NOW ON THE SAME TEAM. Northern Vance High School point guard Malik Glasco (front, center) used to have a rivalry with Coach Greg Ackles (top right) when Ackles was in charge of the hoops program at Southern Vance. 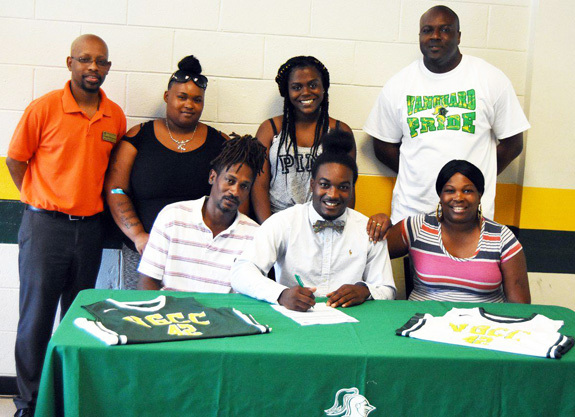 But Ackles is now the head coach at Vance-Granville Community College, and one of his first duties on the job was to sign Glasco to a letter-of-intent during a recent ceremony. 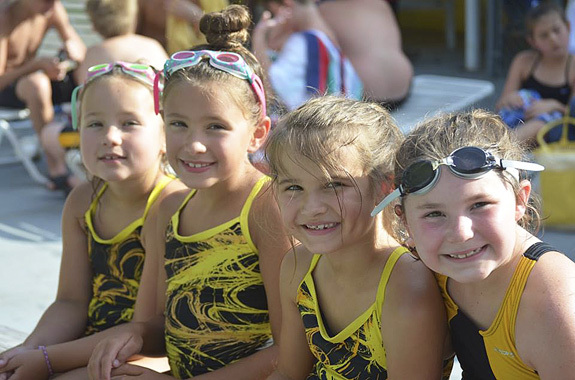 Among this season's members of the Town and Country Stingrays Swim Team are (l to r) Stuart May, Rosalie May, Lexi Leonard and Addison Jones. The Stingrays defeated Winchester last Thursday at home. 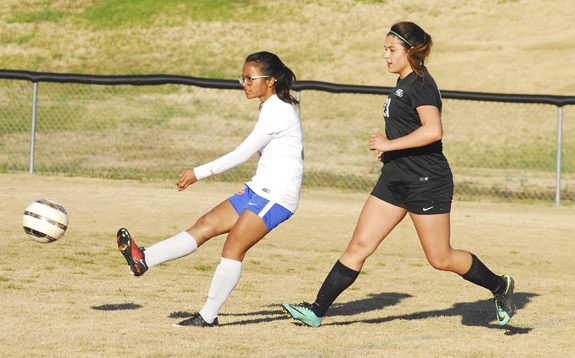 Louisburg High School's Sophie Taylor (left) has earned All-Region Girls Soccer honors by the North Carolina Soccer Coaches Association for the 2018 campaign. Taylor was a senior for the Lady Warriors. 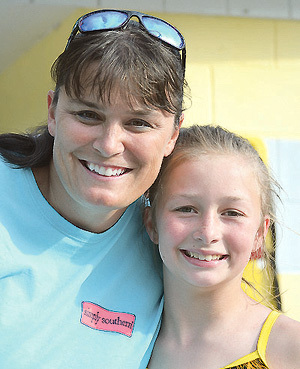 There are 61 members on this year's version of the Town and Country Stingrays Swim Team. The Stingrays have three victories to date this summer. 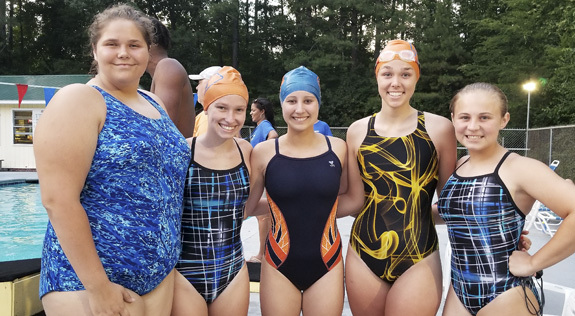 Long-time members of the Town and Country Stingrays swim program are 15-18 Girls age group standouts (l to r) Enya Jones, Robin Cash, Felicity Layton, Audra Jones and Halie Turinsky. The Rays defeated Winchester last Thursday. 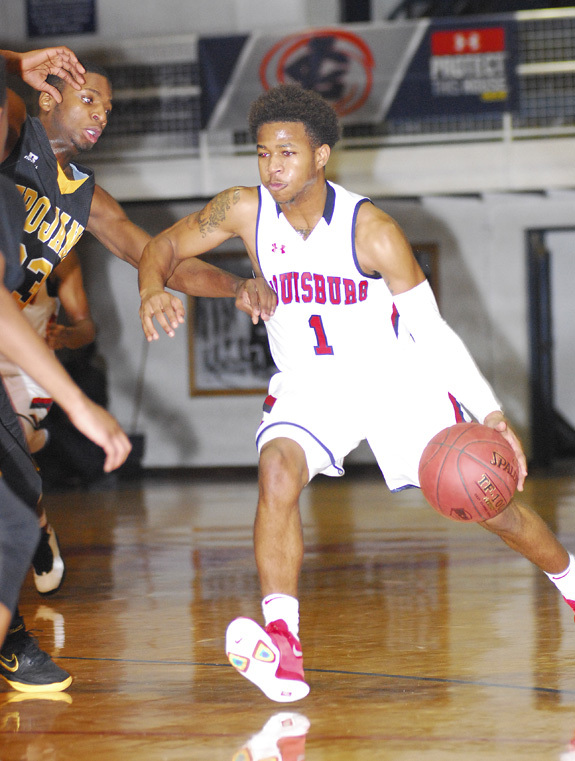 After two successful seasons at Louisburg College, point guard Mikeil Watkins is hoping to make a decision soon about which school he will choose on the four-year level. Watkins, a native of Raleigh, was an All-Region X performer last season and helped the Hurricanes claim the region championship. RJ McCarthy has released Quarry Steps To which is the third crime fiction novel in the Tony Quarry series. The novel is set in the Piedmont area of North Carolina's tobacco country. In Quarry Steps To, Tony Quarry faces the dilemma of his life - to use karate in a circumstance other than to defend himself or to help someone else, a key element of his morality. Lydia E. Cook of Youngsville will be awarded a North Carolina Vietnam Veterans scholarship on Saturday, Aug. 4, at the POW/Mia monthly ceremony held at the Vietnam Monument on the Capitol grounds. She won a scholarship for her essay entitled "White kind of reception did Vietnam vets incur upon their homecoming in comparison to veterans from U.S. military conflicts past and present?" LOUISBURG -- Meeting in a brief special session last Thursday, the Franklin County Board of Education closed out its current fiscal year with a number of mostly routine line item transfers and budget adjustments -- and then was again forced to adopt an interim budget for the fiscal year that began on July 1. Essentially, the school board adopted an interim budget that is a continuation of the current budget -- and it will be used until local schools get final budget numbers from the state. 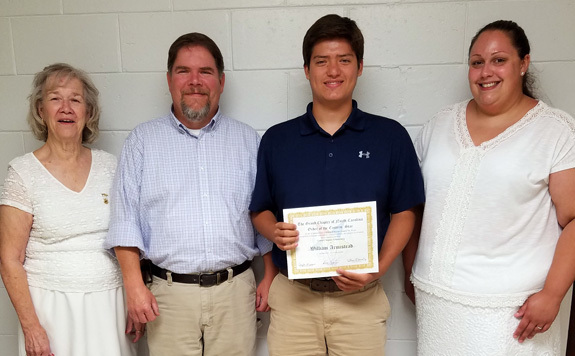 During a recent covered dish supper, The Order of the Eastern Star, on the recommendation of William B. Barrow Chapter #39 of Louisburg, presented a scholarship to William Armistead in recognition of scholastic achievement, community service, and religious involvement. Armistead will be attending East Carolina University this fall and is majoring in biology. LOUISBURG -- The judicial filing period closed last week, signaling the end to two of the longest superior court tenures in the state's history. 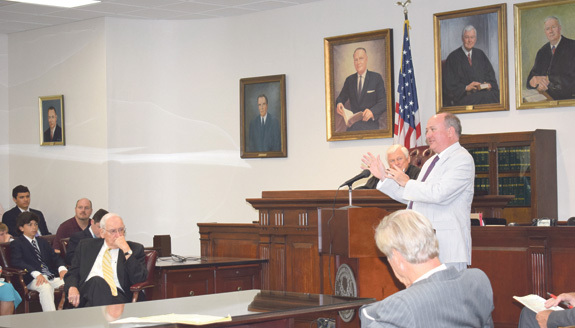 Robert Hobgood stepped down from the bench at the end of April because of the state's mandatory retirement age -- sitting as the longest superior court judge in the state's history. LOUISBURG -- Police arrested a man on gun charges. Officer T. Lincoln arrested Deshawn M. Conyers in the 500 block of Kenmore Avenue on June 29 and charged him with possession of a stolen firearm, carrying a concealed weapon and resisting, delaying and obstructing an arrest. 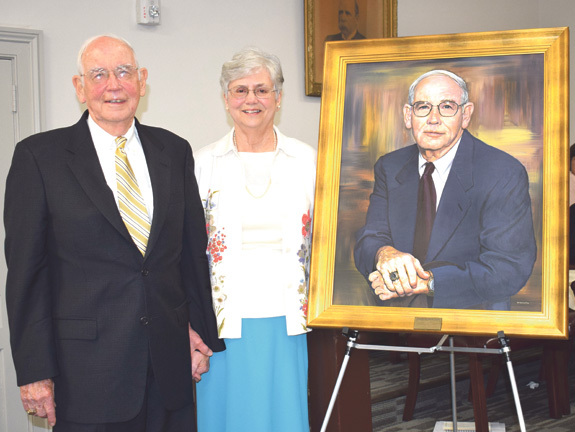 Charles Davis (to the left in a yellow tie) is shown in a rather pensive moment as fellow lawyer and a partner in the Davis, Sturges and Tomlinson law firm, Boyd Sturges, begins the ceremony that concluded with the unveiling of Davis's portrait. It'll hang in the courtroom with those of many other notable practitioners of law in Franklin County.